Yagenbori Nakajima Shoten was established in 1625 near the Yagen Canal in Edo (today the Higashi-Nihonbashi district of Tokyo). Taking a hint from Chinese medicine, sesame seed, Japanese sansho pepper, dried orange peel and other spices were combined with hot pepper to create Shichimi Togarashi or Seven Flavor Hot Pepper. 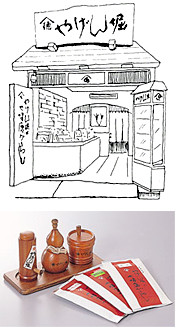 Shichimi went so well with udon and soba noodles–the fast foods of that era–that it was soon a big hit, not only in Edo, but throughout the entire country as well. In 1943 we moved to our present day location on Shinnakamise-dori in front of Sensoji Temple in Asakusa. Shichimi is available in a well-balanced MEDIUM, an extra spicy HOT, and a MILD that places emphasis on aroma. We also retain the tradition of blending spiciness and aroma to suit the particular taste of individual customers. Other products include Ichimi Togarashi or One Flavor Hot Pepper and Japanese sansho pepper.